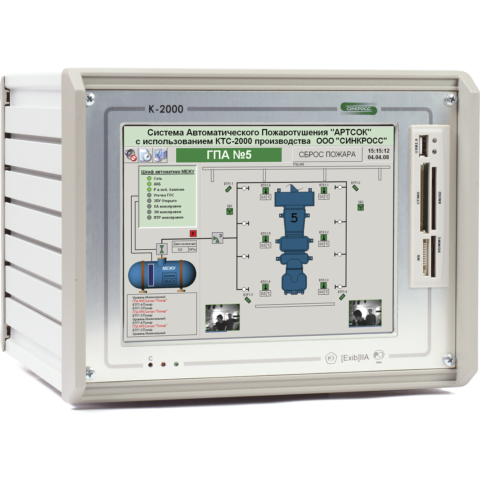 Controller K-2000M is intended for measuring of electrical signals of DC power and voltage and DC resistance received from nonelectric quantities primary converters such as temperature (thermocouples, resistance thermal converter), pressure, vibration, etc., located in explosion hazardous areas at oil, gas and other facilities as well as for displaying, signals logical processing and data input-output. K-2000M is intended for operation in non-hazardous areas of premises and outdoor facilities and can be used autonomously and as part of other technical means of automation such as fire, control, management and protection united in a network by interfaces RS-485(RS-232), etc., for automation tasks performance. communication with equipment including upper level equipment (ULE of Automated Control System, IBM PC type, etc.) via RS-485(RS-232) interface with Modbus protocol. Operating temperature range (10 – 50) °С. Relative humidity of up to 80% at the temperature of 35°С and at lower temperatures with no condensation. The controller includes the abovementioned components in various combinations and quantities including single-type ones – in various modifications: controller contains 9 slots (standard size 4U?42HP) with the general number of Units of current inputs and regulator, heat sensors, digital input-output, repeater transcoder of not more than 9, number of Units of current inputs and regulator and/or of heat sensors is not more than 8. The number of measuring channels is not more than 32.